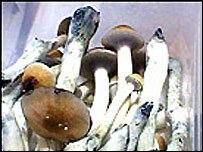 Police say they're still powerless to act over magic mushrooms. Shop owners who sell magic mushrooms still cannot be prosecuted, despite a new Act banning them. The Act, which is frustrating Devon and Cornwall Police, closes a loophole allowing the hallucinogenic drug to be sold fresh and unprepared. The Home Office confirmed it will become an offence to sell them later this year. However until then Devon and Cornwall Police remain powerless to stop the mushrooms being sold. "You won't see anybody on mushrooms causing trouble. It's something that gives people a nice warm euphoric feeling. Police drugs liaison officer Ken Ord said: "I'm glad the government has seen the problem of the mushrooms and is taking action. "However, we're a bit frustrated that we're still waiting for Home Office guidance for the commencement date and how to tackle it." One Plymouth shop owner who openly sells the mushrooms has hit out at the legislation. Stuart Cooper said: "The government are fine to sell tobacco to people and alcohol to people. You go down to Union Street on a Saturday night - go and see the state of people down there. "If we're not allowed to sell them we won't sell them, but we'll feel disgruntled about it." Mr Cooper feels the law is an infringement of people rights and has joined a national campaign to take the government to court.